During the State Department’s daily press briefing in Washington DC, the Robert Wood, the acting senior spokesman congratulated the civic and participatory spirit of the people of El Salvador who exercised their democratic right to vote during the presidential elections on Sunday, March 15. He congratulated Mauricio Funes for winning the presidential election and reiterated the United State’s commitment to work with the new democratically elected government as friends and partners of El Salvador. He also stated that relationship between the US and El Salvador goes far deeper than from one government to the next government. He highlighted the shared history of the two countries spanning several decades and the fact that there more than two million Salvadorans in the United States. Somebody should send a copy of the photo to Congressman Rohrabacher. 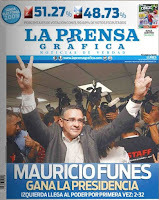 The manner of the FMLN's victory tells the story of a leftist movement eschewing its armed-rebel image for more mainstream political branding: Funes, 49, a former television journalist, is the first FMLN presidential candidate who was never a guerrilla commander. * In El Salvador's last presidential election, in 2004, the FMLN led in early polls until it announced its candidate — the former communist and guerrilla chief Schafik Handal — and went on to be crushed by the ARENA incumbent. This time, the right-wing party managed to narrow Funes' early lead in the polls by painting him, often maliciously, as a puppet of the more radical Latin left led by Venezuelan President Hugo Chavez. The Chavez gambit may have helped defeat the leftist candidate in Mexico's presidential election in 2006, but it didn't work in El Salvador on Sunday — chiefly because Funes successfully painted himself as an ally of the more moderate Latin left headed by Brazil's President Luiz Inacio Lula da Silva. For those tired of the Bush vs. Chavez polarization that has mired the Americas of late, it was an apt coincidence that Lula had been huddling at the White House a day before the Salvadoran vote with the hemisphere's other alpha moderate, President Barack Obama. Funes had identified himself with the spirit of the pragmatic, bipartisan Lula Left in his campaign, and met with the Brazilian a number of times. He hit the stump not in the lefty-red attire favored by FMLN leaders (and by Chavez) but in white guayabera shirts. He also assuaged voter fears by convincing his own party to drop its insistence on lifting El Salvador's amnesty for civil war crimes, on revising the Central American Free Trade Agreement (CAFTA) and on reversing El Salvador's 2001 adoption of the U.S. dollar as its currency. * Actually, Padgett is wrong when he says that Mauricio Funes "is the first FMLN presidential candidate who was never a guerrilla commander". That would be Rubén Zamora, who forced Arena to a run-off election but lost to Armando Calderón Sol in that second round. Zamora was a prominent member of the Christian Democratic party before the war, but in the 1980's joined the FDR, a non-guerrilla grouping of leftist parties. He became well known for participating in the peace talks. (Thanks to Solava for pointing this out in a comment). The New York Times article on Funes' victory points out that the president-elect "sent a strong message that he intended to continue El Salvador’s close relationship with the United States, by meeting with the charge d’affairs at the United States Embassy shortly after his victory speech." Tens of thousands of Salvadoran immigrants in the United States flew home to vote in a tense race that has reopened wounds from the 1980-92 Cold War-era conflict. In fact, only 201 Salvadorans living outside the country returned to cast a vote. Eduardo Ramon Recino, 46, a trash collector, said he had always voted for Arena. But supporting a wife and five children on a salary of about $15 a day, living in a tiny cinder-block home where a hammock is the main piece of furniture, made Recino reconsider. "It's our tradition to vote for Arena," he said. "But you know, they haven't really done a lot to solve our problems. For good or for bad, the country needs a change." Silvia Gomez, 51, of the San Salvador working-class suburb of Soyapango remembered the military patrols that spooked her neighborhood and took away her brother-in-law, never to be seen again. "We knew this day would come one day," she said of a likely FMLN victory. "Not like a dream, but like something you see out there and it just takes a little more effort to reach it." Salvadoran supporters who favored Funes took to the streets in cities and towns throughout the country as the victory became known. La Prensa Grafica photogalleries 1, 2, 3, 4, 5, 6, 7. Thanks to Karina for sending me some of her photos. Thank you for blogging and keeping us informed through this historic process. Tim Padgett of Time Magazine is wrong when he says that Mauricio Funes "is the first FMLN presidential candidate who was never a guerrilla commander". That would be Rubén Zamora, who forced Arena to a run-off election but lost to Armando Calderón Sol in that second round. Zamora was a prominent member of the Christian Democratic party before the war, but in the 1980's joined the FDR, a non-guerrilla grouping of leftist parties. He became well known for participating in the peace talks. I just wanted to say, THANK YOU TIM, for give us the opportunity to be inform through out the elections, WITH EMPHASIS. Thanks, Tim, for an excellent roundup and your coverage throughout. And many thanks for that correction, Solava. Tim, that's important enough that I think it deserves an update within the post. 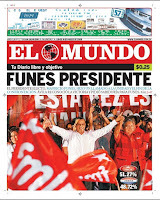 Many have written that Funes is the first non-comandante to run for the FMLN, but one could argue a technical point. In fact, in 1994 Zamora was the candidate of the FMLN-Convergencia Democratica. 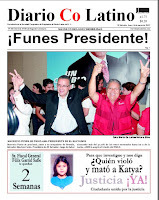 So yes, he was the FMLN candidate -- but he was the CD's candidate, and officially launched as a coalition candidate.